You don't need to load your iPad up with a lot of music to have listening options. 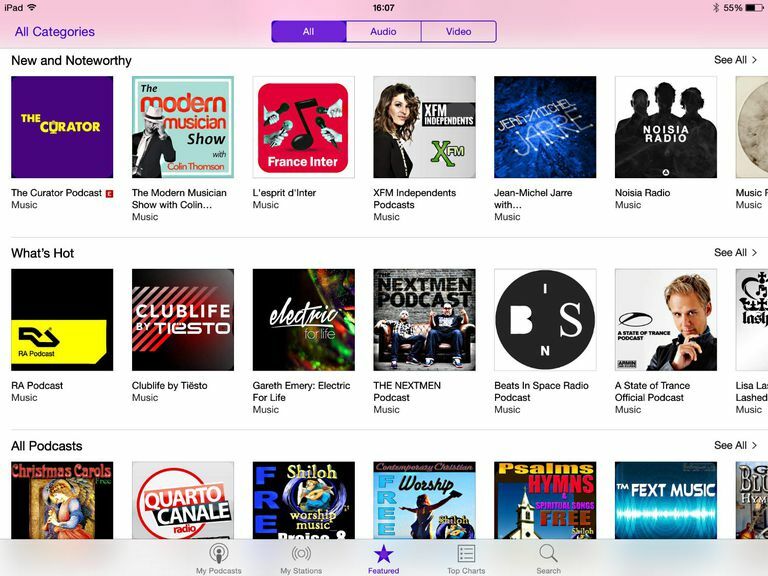 The App Store offers everything from streaming radio stations from the Internet to creating your own radio station, and the great part is that many of these apps are free to download and enjoy. Most have a subscription plan to remove ads, but many are still quite functional if you never pay a dime. Note: This list is dedicated to listening to music. Want to play music? Check out the best iPad apps for musicians. Rich database with a great recommendation engine. Balance of free and paid tiers. Pandora is included in some entertainment platforms. Reduced interest because of Spotify and Apple Music. Focus on radio station formats, rather than defined playlists. While this list isn't ordered from best to worst, it's hard not to start with Pandora Radio. This app allows you to create a personalized radio station by choosing an artist or song. Pandora Radio will utilize their extensive database to pick out similar music, and the great part is that this database is based on the actual music, not just what other songs and bands fans of that particular artist also like. And if you want to add variety to your station, you can add more artists or songs to it. Pandora is supported by ads. You can get an ad-free version by subscribing to Pandora One, which also offers higher quality audio. Part of Apple's hardware and software product line. Recommendation engine isn't as solid as Spotify. Hard to use if you're not familiar with Apple products. You don't need to download an app from the App Store to stream music to your iPad. Apple's first attempt at streaming (iTunes Radio) was a bit shaky, but after buying Beats, Apple stepped up its game and built Apple Music on the foundation of Beats Radio. In addition to the standard fare of streaming music for a subscription and creating custom radio stations based on your favorite artist or song, Apple Music streams Beats 1, an actual radio station. Some metadata isn't easily available. Spotify is like Pandora Radio on steroids. Not only can you create your own custom radio station based on an artist or song, you can also search for specific music to stream and make your own playlists. Spotify has a number of genre-based radio stations built into it, and by connecting to Facebook, you can share these playlists with your friends. However, Spotify does require a hefty subscription to continue listening after the free trial runs out. The interface isn't quite as slick as it could be, and some of the recommendations are quite spotty. (The Bee Gees are similar to Santana? Really?) But considering you can play both personalized radio stations and playlists with specific music, you may find the subscription is a great way to save money on buying music. Terrestrial radio, through the internet. Basic radio-station approach to personalized playlists. Interface on mobile devices shows its age. Works with radio networks formally affiliated with iHeartMedia. As its name suggests, ​iHeartRadio focuses on the radio. "Real" radio. With more than 1,500 live radio stations from rock to country, pop to hip-hop, talk radio, news radio, sports radio, you name it, it's there. You can listen to radio stations near you or listen to your favorite genre as presented in cities around the country. Like Pandora and Spotify, you can also create a personalized station based on an artist or song, but the real bonus of iHeartRadio is access to real radio stations and the lack of any type of subscription requirement. Reasonable, multi-tier price points for the subscription service. Follow public playlists to discover new music. Tries to do a bit of everything, but doesn't master any of them. Less opportunity for natural discovery outside of someone else's recommendation. Slacker Radio is like a Pandora with hundreds of finely crafted custom radio stations. You'll find a bit of everything here, and each station has dozens of artists programmed into it. Slacker Radio also offers live radio stations, and goes beyond music with news, sports and talk radio. You can also personalize your own listening experience with custom stations and playlists, but the real bonus in this app are the handcrafted stations. Robust set of terrestrial radio stations. Curated playlists can be hit-or-miss. Easily one of the best apps for streaming radio stations across the country, TuneIn Radio is perfect for those who don't need to customize a radio station or simply as a companion to Pandora. TuneIn Radio has a simple interface that is easy to start using. One nice aspect is the ability to glimpse what is playing on the radio station — the song title and artist is displayed below the radio station. And TuneIn Radio packs in 70,000 stations, so you'll have plenty of choices. Integrates well with Apple Music and Spotify. Great for identifying a song currently playing. Not a music curation platform. Focuses on identifying music that is playing within earshot. Shazam is a music discovery app without the streaming music. Instead, Shazam listens to the music around you and identifies it, so if you hear a really cool song while drinking your morning coffee at the local cafe, you can find out the name and artist. It also has an always listening mode that constantly checks for nearby music. Huge catalog, with user-contributed content. Great for emerging talent not yet signed by labels. Tools to search the massive catalog aren't up to the task. Soundcloud is quickly taking over as the lesser-known musician's playground. It's a great way to upload your music and have it heard, and for those who love hidden gems, it will give you an experience, unlike the one you'll have on Pandora Radio, Apple Music or Spotify. But it is not all about discovering new talent. There are plenty of well-known artists using the service. Soundcloud has also become a favorite way to share music online. Curated by experts and by the artists. Hi-Fi offering is more than twice the price of the competitors. Relatively modest catalog compared to other services. TIDAL's claim to fame is its high-fidelity sound quality. Labeled a "lossless audio experience", TIDAL streams CD-quality music without compromise. However, this high fidelity stream will cost you more than most other subscription services at $19.99. TIDAL does offer a $9.99 a month "premium" subscription, but this loses the main feature that sets TIDAL apart. Still, for those who want the absolute best music experience, the extra money may be worth it. Powered by YouTube, a Google company. Few value-added features, like human curation. What may set YouTube Music apart from the rest of the services on this list more than any other thing is the fact that it is not an iPad app. For whatever puzzling reason, Google made YouTube Music an iPhone app. Perhaps the service just hasn't taken off enough to create a tablet interface, but for whatever reason, Google has neglected the iPad. But the iPad hasn't neglected Google. You can run YouTube Music perfectly fine on an iPad in iPhone compatibility mode, which automatically runs when you launch an iPhone app on your iPad. The app may look a little odd blown up to fit the size of the iPad screen, but it works fine. The hardest part is finding it in the app store. You can use the link provided here, or you can search for it in the app store. However, you will need to tap the "iPad Only" link in the top-left corner and change it to "iPhone Only" for YouTube Music to show up in the results.